56ft Obstacle Challenge with Slide. Great for all ages. Starting Rental Price of $269/day. All of our rates are by the day, we deliver in the morning and pick up at night. We ask for a 20% deposit with the remaining balance due on delivery. Double 56ft Obstacle Challenge with left and right for competition races. Great for all ages. Starting Rental Price of $449/day. All of our rates are by the day, we deliver in the morning and pick up at night. We ask for a 20% deposit with the remaining balance due on delivery. This Warriors Jump interactive obstacle has a series of 7 inflated "pillows" inside that the participant runs / jumps across to reach the end slide platform and slide to exit. 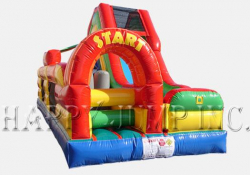 This unit can be connected to our 40ft or 70ft Obstacle Slide to create a Mega 122ft Obstacle Course. 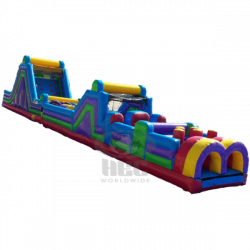 60 ft Obstacle consists of the 30 ft obstacle and the Rock Climb slide. 40ft Obstacle Course. Starting Rental Price of $269/day. All of our rates are by the day, we deliver in the morning and pick up at night. We ask for a 20% deposit with the remaining balance due on delivery. 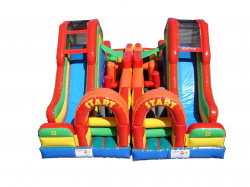 Our 16ft Rock Climb Slide can be used as a stand-alone unit or it can be connected to our Obstacle Courses to create a Mega Obstacle. $249 for the day for just the slide. 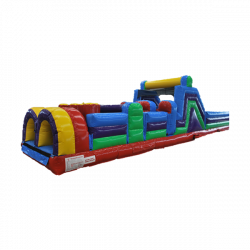 30 ft Obstacle course with jump through openings, pop ups, log jams, squeeze walls, and crawl tubes. Perfect to backyard events. 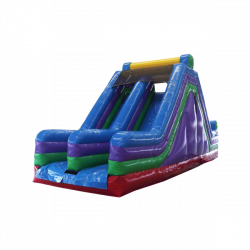 Can be connected to our 40ft Obstacle, Rock Wall, and Warrior Jump for even more obstacle fun! Starting Rental Price of $229/day. All of our rates are by the day, we deliver in the morning and pick up at night. We ask for a 20% deposit with the remaining balance due on delivery.